← Why do we eat? 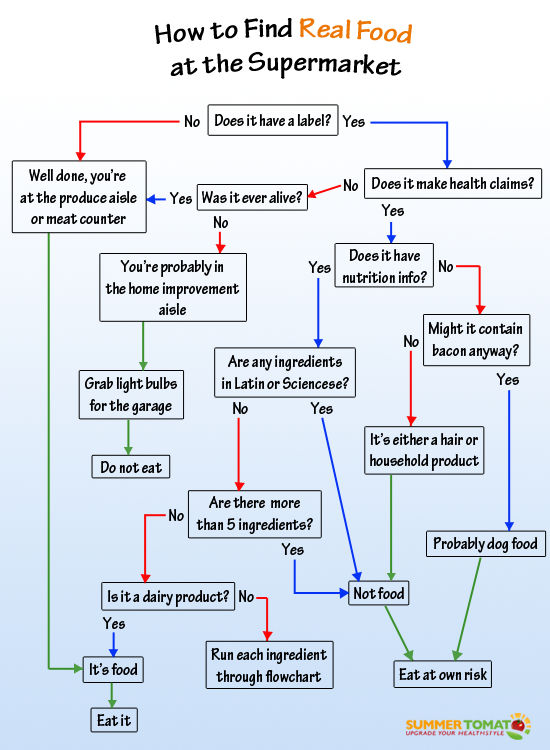 Here is a great guide to help you find real food on your next trip to the supermarket! It’s also rather humorous. I love this chart! Way too funny! Thanks go out to My Sister’s Pantry and Truthology.net. I love feeding my family ‘real food’ and read the labels of EVERYTHING. Sometimes what I find is scary. However, with a family of 5, balance is necessary. We eat real food and throw in organic when we can afford it. I love this flow chart because it is simple and straight to the point. Too much ‘Sciencese’ is not good for you. Thanks to all for the re-blogs and comments! I actually laughed out loud reading this! This blog is going into the rotation! do, they don’t seem to last as long or produce as much juice.